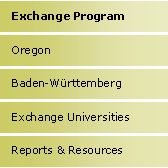 The Oregon-Baden-Württemberg Exchange Program facilitates student exchange between Oregon and Baden-Württemberg. Each year, about 40 students from Baden-Württemberg and another 40 students from Oregon have the chance to study abroad away from their home university. Exchange students receive a stipend that covers the tuition at their host university. Even after the restructuring of the German university system, studying abroad for a year is more worthwhile than ever. The members of the Oregon Alumni Association gladly share their experiences and provide tips. We would like to add to this list of links. If you know a good reference that is missing here or want to share some information with our OAA community, please contact us at: webmaster[at]oregon-alumni.de.